Each of the above images can be read as the term Reiki by most Japanese people. 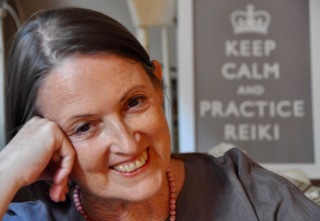 The image most Reiki practitioners in the West are familiar with is the middle one, which is used on many book covers, websites, publicity material, and even the logos of many of the largest Reiki Professional Organisations, including the Reiki Association and UK Reiki Federation here in the UK, where I live. Which image do you think would be the one most familiar to the general public in Japan? 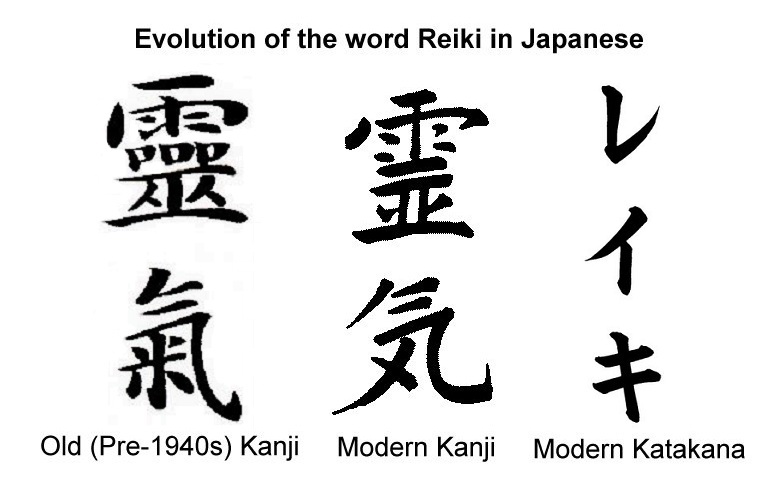 Interestingly, it would be the one on the right, the modern Katakana way of writing the term Reiki. Before I explain why that is, let’s look at how the Japanese language is written. 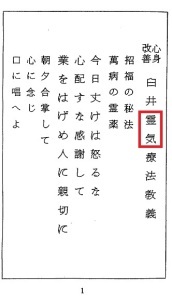 Kanji is the oldest character set. Kanji actually consists of Chinese characters (hanzi) that were imported into Japan, where they became known as kanji, around the 5th century CE. Today only around 2,000 of the 5,000 to 10,000 original kanji are in regular use, as the result of revisions of the Japanese language in 1946 and 2010. Many kanji are based on stylised pictograms, and their component parts (or radicals) can have their own meaning. Many kanji can be read with both a Japanese pronunciation (kun yomi) and a Chinese pronunciation (on yomi), depending upon the context. Hiragana is a syllabic script in which each character represents the sound of a syllable. This was not always the case. Hiragana was once a script used only by women, derived from the kanji, and having several different characters representing a single syllable. The simplified one-to-one syllable correspondence was finalised as late as 1946. Katakana is also a syllabic script, originally considered “men’s writing.” It is based on characters that were used by Buddhist monks as an aid to correct pronunciation of Chinese texts. Why would most modern Japanese people be more familiar with the katakana way of writing Reiki? The answer is that, although the practice of Usui Reiki Ryoho became quite popular in parts of Japan before World War 2, such practices declined after the war, only surviving in isolated locations, and the term Reiki slipped out of use. As people from the West began to teach Reiki practice in Japan, some students did not even recognise the term Reiki as being Japanese, so it became written as an imported term, using the phonetic characters re, i, and ki in katakana. 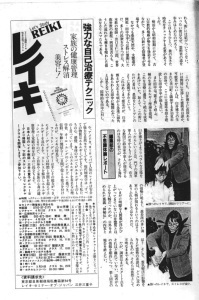 An article about Reiki practice in a Japanese magazine from 1986 has an ad for Barbara Ray’s book, with Reiki written in large katakana and romaji (Western letters) rather than kanji (below left). Meanwhile, even some Japanese Reiki practitioners in that bastion of Usui Reiki Ryoho, the Gakkai,* were now using modern kanji to write the term Reiki, as can be seen in Japanese copies of their handbook, which was published in the mid-1970s (below right). PART TWO of Colin’s article discusses how the term Reiki was written in the time of Mikao Usui, and specific points about the meaning of the kanji. There you will also find a pdf version you can print out and use for yourself and your students. 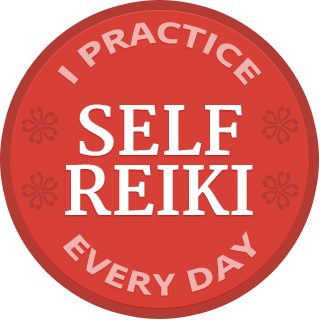 *The Usui Reiki Ryoho Gakkai (Usui Reiki Healing Method Society) was originally set up by some of Usui’s students shortly after his death in 1926 (some sources say that it was set up by Mikao Usui himself in 1922), with the aim of preserving the practice Usui Reiki Ryoho. The first few Chairpersons of this society were naval officers. The Gakkai went underground during the post World War 2 clamp down on traditional oriental healing methods and militaristic/nationalistic organisations. The Gakkai has remained hidden and, although there are still some branches in existence, it is not known exactly how many members there are. It functions as a closed society, only accepting family members. Other Japanese Reiki practitioners are no longer allowed to join. Most members are very old, and unless younger practitioners join, the Gakkai could die out in the not too distant future. 3. http://www.aetw.org/reiki_1986_article.htm Translation of the 1986 Japanese Twilight Magazine Reiki article, a page from which is shown above. Thank you to Paul Selk for his fact-checking assistance. What Does the Reiki Kanji Really Mean? Escrever Reiki a Evolução da Palavra Reiki no Língua Japonesa is a Portuguese translation of this article, Writing Reiki, and What Does the Reiki Kanji Really Mean? that you can print and share as is, without copying or changing the content or presentation in any way. Please do not email or post it on your website, but you are welcome to post a link to the article here. Thank you for your support. I enjoy seeing the kanji together, showing the history as well as the power of three. Thanks for sharing. 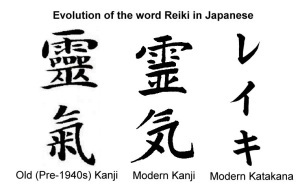 How do I think we (the wider Reiki Community) might best write the term Reiki in our publicity material, according to the original or the modern kanji? Well, I find myself of two minds. I find the older/original form more aesthetically pleasing. I seem to connect with it at a deeper level. On the other hand, I think that the modern kanji may be more accessible, to more people, in more places, as long as it is also accompanied with the English word. I feel that the dual reference is best for publicity, especially when attempting to connect with people outside the sphere of Reiki Community. I definitely would not use the modern katakana. While it is easier to write, it lacks the depth of presence that either of the two other forms possesses. As a Reiki/Master Teacher it is so nice to read an article that expresses the importance about keeping Japanese tradition of Reiki sacred. When people dilute the tradition, it dilutes the power of it. Thanks for sharing. As a lover of language, Colin…well, what’s not to love about your article? Looking forward to next week! Thank you for this most interesting article. I am looking forward to reading part 2 next week. I’ve shared this with others. Done! Thanks for the clarification, Peter and Colin. where it should read “now using katakana to write …”? The left hand picture looks like the manual referred to. In the context of the paragraph topic I don’t know what the picture on the right is supposed to illustrate. Can you explain? 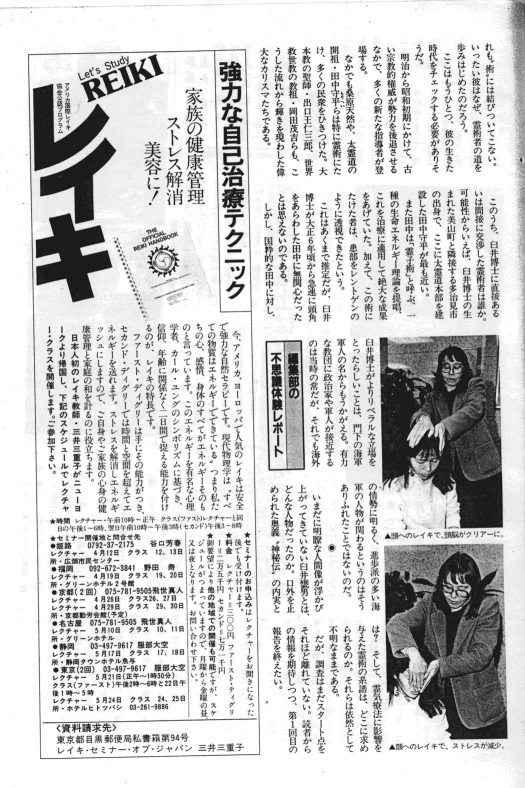 In the paragraph above the one you quote it says: “An article about Reiki practice in a Japanese magazine from 1986 has an ad for Barbara Ray’s book, with Reiki written in large katakana and romaji (Western letters) rather than kanji.” This is what is shown in the picture on the left, i.e. a magazine article with the word ‘Reiki’ in large katakana and romaji. The picture on the right is actually the Reiki Precepts (Gokai) as printed in the handbook of the Gakkai. 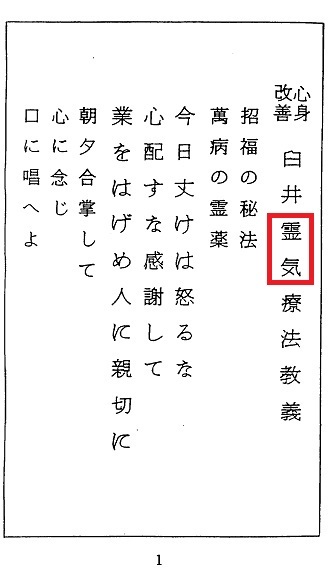 The red box indicates the word ‘Reiki’, printed in modern kanji. I love this post. As a committee member of Reiki Federation Ireland, we use the Kanji everywhere on our correspondence, posters and flyers. Its wonderful to be able to share this post with them to look at the history and the current use of the Reiki Kanji. You continue to provide high quality and interesting posts relevant to the Reiki community. Kudos to you Pamela. Thank you, Abby. It’s critical to the future of Reiki practice that we make unbiased, well researched, clear perspectives on our practice available to the public and the diverse Reiki community.